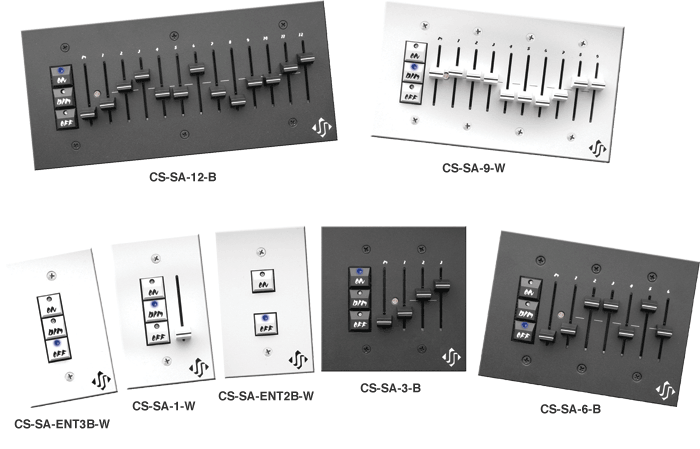 CS-SA Series - 'Super Analog' Time Fade Stations. Available from single to 12 channels with master, preset and take control functions. These universal stations are designed to operate on DC supply voltages from 10 to 18 volts. Their output is digitally adjustable from the station for exact control voltage requirements. Adjustable time fade and LED intensity allow customization for demanding applications. Durable powder-coat finish is available in either black or white. CS-SA-1-? 1 gang, single channel manual control w/on, preset, and off. CS-SA-3-? 2 gang, 3 channel manual control w/master slider, on, preset, and off. CS-SA-6-? 3 gang, 6 channel manual control w/master slider, on, preset, and off. CS-SA-9-? 4 gang, 9 channel manual control w/master slider, on, preset, and off. CS-SA-12-? 5 gang, 12 channel manual control w/master slider, on, preset, and off.